6/13 Cup of Coffee: Three outstanding pitching performances and an offensive outburst from Greenville led to the Red Sox system going 4-0 on Sunday. Aaron Wilkerson, Mitch Atkins, and Trey Ball combined to allow just one run in 17 1/3 innings pitched. The bullpens for Pawtucket, Portland, and Greenville were also terrific. Aneury Tavarez, Chad De La Guerra, and Michael Chavis had big offensive days. Yoan Moncada and Andrew Benintendi also had multi-hit games. Aaron Wilkerson, Robby Scott, and Noe Ramirez combined for a four-hit shutout to preserve a 1-0 win for the PawSox. Wilkerson started and went the first six innings, allowing just three hits and a walk while striking out seven. His ERA is down to 2.25 with the PawSox and it has dipped below two at 1.98 overall in 2016 between Pawtucket and Portland. Scott struck out four during his two shutout innings, and Ramirez picked up his second save with a scoreless ninth inning. The lone run of the game came in the second when Ali Solis singled in Bryce Brentz after he had doubled to open the frame. 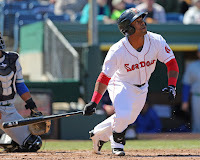 Solis went 2 for 3, as the PawSox recorded just three hits. The Sea Dogs also received some tremendous pitching, but they hit the ball better than Pawtucket, scoring seven runs on 10 hits. Andrew Benintendi stayed hot by going 2 for 4 with an RBI. He is now 5 for his last 12. Aneury Tavarez had a huge game, going 3 for 3 with his first home run of the season, a double, a walk, two RBI, and two runs. Ryan Court also had a nice game by going 2 for4, and Rainel Rosario added an RBI triple. Mitch Atkins picked up his second win with the Sea Dogs after tossing six innings of one-run ball. He gave up just one hit and one walk while punching out seven. Luis Ysla came on in relief and delivered two scoreless innings with two strikeouts. Chandler Shepherd finished it off with a scoreless ninth. Despite a late charge by the Blue Rocks, the Red Sox were able to hang on with a 6-5 win. Salem looked to be in cruise control through their half of the seventh inning when they led 4-0 before the bullpen made things interesting. Trey Ball turned in a terrific outing for Salem, throwing 5 1/3 innings and allowing no runs on five hits, two walks, and three strikeouts. He picked up his third win and lowered his ERA to 2.60. German Taveras gave up a run in 1 2/3 innings of relief. Bobby Poyner didn't have it Sunday, giving up four eared runs on five hits and two walks in two innings. Five Red Sox had multiple hit games, including Yoan Moncada, Mauricio Dubon, Rafael Devers, Danny Mars, and Joseph Monge. They all went 2 for 4. Both of Mars' hits were triples, as he drove in two and scored twice. Dubon stole his 21st base and Devers also swiped a couple bags to give him seven on the year. Jordan Betts added an RBI single in the eighth, giving the Red Sox a 6-1 lead. It didn't seem significant at the time, but it would prove to be the deciding run in the ballgame. The Drive won a slugfest on Sunday. After falling behind 6-0 in the first inning, the offense was able to put up at least one run in six consecutive innings, including a pair of three-run innings. Michael Chavis had a huge game by going 2 for 4 with a home run and four RBI. Chad De La Guerra also had a big day out of the leadoff spot by going 3 for 5 with three runs scored. Tyler Spoon also had a three-hit game, including his second long ball of the season. Luis Alexander Basabe had two hits as well. Interestingly enough, the number three and four hitters for the Drive were the only members of the lineup not to record a hit. It was not Roniel Raudes' best start. He gave up six runs in the first inning, punctuated by a grand slam. In all, he went four innings and allowed eight earned runs. However, the bullpen was terrific. Marc Brakeman grabbed his fourth win by going three innings in relief without allowing a run. He struck out four and did not walk a batter. Anyelo Leclerc had a two-inning save, tossing the final two innings without allowing a run. Player of the Night: Despite a huge offensive day in Greenville and three outstanding starting pitching performances throughout the system, it was Aneury Tavarez' day that stood out. He had a perfect day at the plate, reaching in all four plate appearances with a walk, a single, a double, and a home run. He raised his season line to .276/.345/.393. His OPS this season is over 100 points higher than his .616 mark last season with Portland.